The Ludwig family is proud to be celebrating our 5th generation in the flower business in Pittsburgh! Our goal is to offer the best in quality, value and service for all your floral gift needs. Most of our flowers are grown and shipped directly from flower farms in South America, allowing us to provide the freshest flowers available, with no extra middle-man mark-ups. Customer service is always our number one priority. Our customers like our "go the extra mile" service. We try hard to accomodate special requests and rush deliveries. We have a 100% satisfaction guarantee. If you are in any way dissatisfied with our product or service, please let us know within 24 hours, or as soon as possible. We will do our best to correct the problem by replacing or exchanging the product, or adjusting or refunding your purchase price. 7% sales tax is added to all orders. Occasionally, due to the seasonal availability of flowers, we may need to make substitutions to what is pictured in our photos online. We make every effort to maintain the “look and feel” of the floral arrangement chosen, with an eye to colors and style, substituting with flowers of equal or greater value. Ed’s son, Jim Ludwig Sr., joined him in the business in 1947, and the business name was changed to Ed and Jim Ludwig Flowers. Over the years, Jim served as regional director of FTD and president of Interflora. In 1990, Jim Jr. and his wife, Linda, purchased our current building in Pittsburgh’s Strip District. It was originally intended to be a centralized hub and offices for our other stores. However, during the ’90’s we found that the economy of one centralized location suited the logistics of the flower business quite well. After 70 years downtown, we moved out of the Koppers Building, and we now have only this one location. In 2006, we were fortunate to have Bob Ludwig join our business. (Bob is a distant cousin of Jim, as their grandfathers were first cousins.) Members of Bob’s family were florists on Pittsburgh’s North Side since the 1880’s. 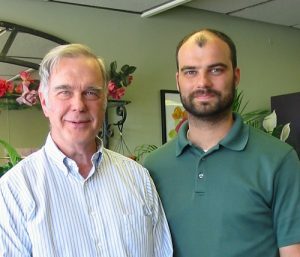 In September of 2006, Bob closed Ludwig Floral Company on East Ohio Street, and joined our company. He brings with him over 50 years of floral experience. President Tim Ludwig, son of Jim and Linda, grew up in the floral business, working part-time in the shop through his high school and college years. He joined our company full-time in 2009, after graduation from the University of Dayton.